« Whew! Fishing Definitely Better! Lots of rain the past three days. Springfield received over two inches. Other areas north and east of Springfield received a lot more. I think we are out of the rain for a couple days, at least until Friday, when they predicting more chances for showers on Friday and through the weekend. Today is a beautiful bright, sunny day with temperatures expected to be in the upper 80s. It is a little humid. Thursday through the weekend, temperatues will hover in the upper 80s to low 90s. Generation was off almost all day both Saturday and Sunday. Monday, the generation was spastic. Full one unit, then down to a low one, then up to a full one, then a low three. Where oh where do the fish want to go? Yesterday, was a nice, fairly even low one unit running all morning which they bumped up early afternoon to not quite the equivalent of a full two units. Today the projection is pretty much the same as yesterday. That remains to be seen! dropped from the size 12 big ruby. 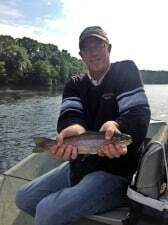 Darrell back on the water Tuesday with Bob and Dave from Pennsylvania. Another good day but this time is was on the copperhead black zebra midge. 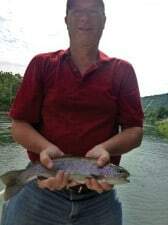 This entry was posted on Wednesday, July 31st, 2013 at 11:14 am	and is filed under Fishing Reports. You can follow any responses to this entry through the RSS 2.0 feed. You can leave a response, or trackback from your own site.